William Belickis, previously the chef at MistralKitchen. Back at MistralKitchen on Westlake, chef William Belickis oversaw multiple kitchens, outfitted with everything from tandoor to wood fire to modernist gear, six dining rooms, and a menu that sent seasonal Pacific Northwest ingredients on elegant excursions around France and the northern Mediterranean. Mexican food was a rare cuisine not somehow part of his ouevre. And yet the chef, who closed MistralKitchen last January after eight years, has been spotted in recent weeks at Chavez, 12th Avenue's atmospheric destination for chiles en nogada and a proper margarita. Last Friday marked the first step in Chavez's transformation. Belickis took over January 1, and will turn the space into Violet, a spot that will distill aspects of MistralKitchen—and its more formal predecessor, Mistral—into a way more intimate dining room. The backstory on this unusual, and unusually quiet, rollout is a convergence of several longtime names in Seattle dining. After a year off, Belickis was ready to cook again. 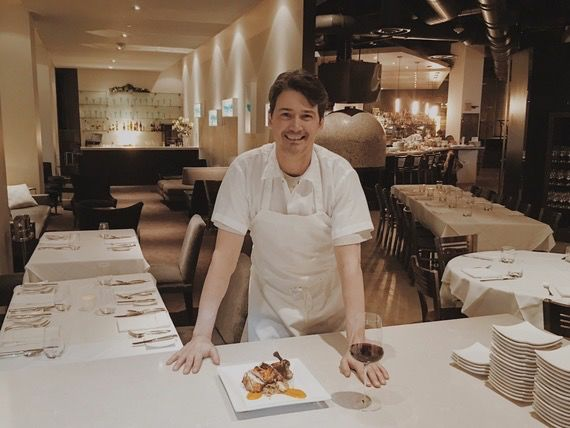 Meanwhile, longtime business partners Trevor Greenwood and Wade Moller had decided to split up and divide their Seattle restaurant properties between them. Greenwood took Cantinetta and Moller got Chavez. The latter was looking for someone to take it over, says Belickis, and had been a longtime regular at Mistral and MistralKitchen. Belickis stepped in January 1 (though Moller's still involved in the business) and started getting to know the space and the staff. Save adding some planter boxes and wine storage, he's not doing much to alter the space, which is pretty effortlessly charming. Last Friday he changed over the cocktail menu. Next comes a MistralKitchen-esque array of menus: tasting, bar, and a la carte. And a broad wine list. Violet will be fully realized by Valentine's Day. Belickis says the name "Yolanda" has been in his family for more than 500 years, most recently with his daughter. It's an old Latin variant of Violet. Plus, "just the idea of having a pretty, fresh flower," tracks with his delicate, seasonal menus, says the chef. In the MistralKitchen days, Belickis's collection of cooking implements were the stuff of dining legend. "No new stuff yet" in Violet's kitchen, he says. "But I definitely have some things coming."